"That the number of times you will have to go back into a store to retrieve items your children have left behind (x) is directly proportional to the number of children you brought with you (a), the number of items they brought in (b), and the number of stores you have visited (c), and also inversely proportional to the number of items you went into the store for in the first place (z). If the resulting figure is greater than 2, not all of the items will be retrievable. I believe that! Must be a mini circus! You get a divide by zero error and crash the program if you are just "browsing" or "window shopping", although perhaps that is something that mothers with small children never do. Also, if you have two children, only one has brought an "item" (lets call it a toy), and you go to one store to buy one thing (a fairly simple situation), your formula says that you have to go back into the store to retrieve 4 things, and not all of them will be retreivable... but they only had one to begin with! 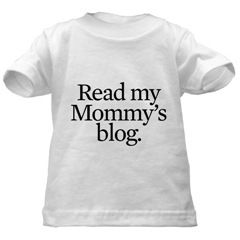 You may rule at mommyhood, but you're failing math. Sorry, sis!